As the election for the seat in Alabama draws ever closer, the Republican candidate Roy Moore has been holding his own in the polls. Despite the numerous accusations of sexual misconduct against him, many polls still point to a narrow lead. There is no denying that the accusations have been holding down his public support, the most damaging of which being that of Beverly Young Nelson who has been using a year book as “proof” of a relationship between herself and Moore. But breaking news has just come out that she did in fact forge at least part of the message contrary to her earlier statements. Despite earlier claims that Roy Moore had written the whole thing, she is now stating that the message was from him but not the “notes.” It is, in fact, the “notes” that have been used to prove there was a link between the two. Ever since photos of the year book have been circulated in the media, the authenticity has been questioned. Young Nelson’s lawyer, Gloria Allred has vigorously defended the year book without quite stating that she believes it to be real. And now we know why. When an accuser is found to be lying about one part of their accusation, it does not necessarily mean that the rest of their statement is false, but it certainly doesn’t help. But here’s the thing: The ink! The message is split into two parts, one in one color ink and the rest in another. If, as Young Nelson claims, she was just making notes, why is the surname in the new ink color? 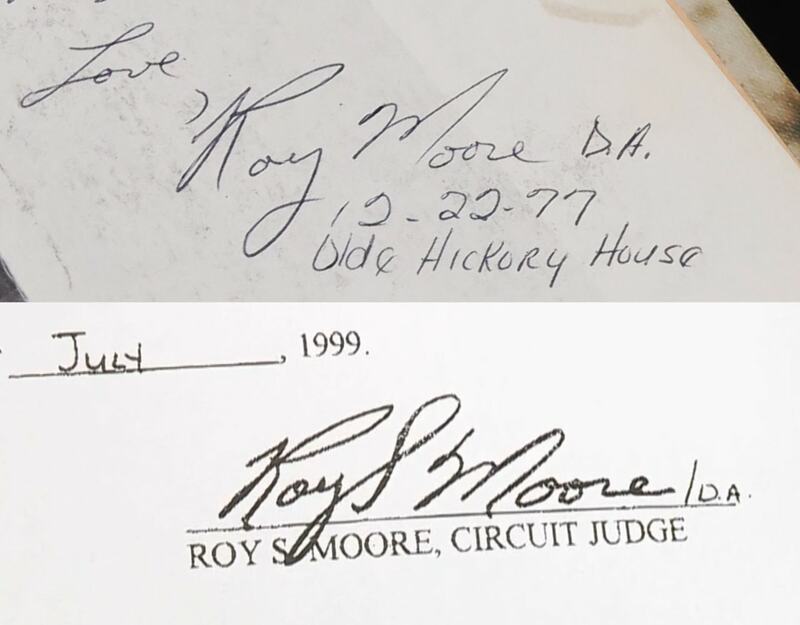 And why does it look suspiciously like Moore’s signature. If she were just making notes, why would she attempt to write his surname to look almost exactly the same? This part at least is at an attempt at forgery. It is all very well having an interview with a script-leading “reporter” accompanied by your lawyer to explain your actions, but the fact that she will not appear in public without legal help makes one wonder what they are afraid she might say. Is it possible that if left to the regular media, she might be asked a flat out question and be unable to answer without destroying the narrative? Why did you try and write Moore’s surname in the same style? Why did you not mention before that you had written part of the note?